Image if you will, a society much like the middles ages you’re read about and seen portrayed in movies and on TV. Now imagine there was an organization like the Scouts that educated the children in woodraft, ecology, hunting and similar pursuits and was call Lookout. Throw in some fantasy elements, such as strange creatures and some magic. 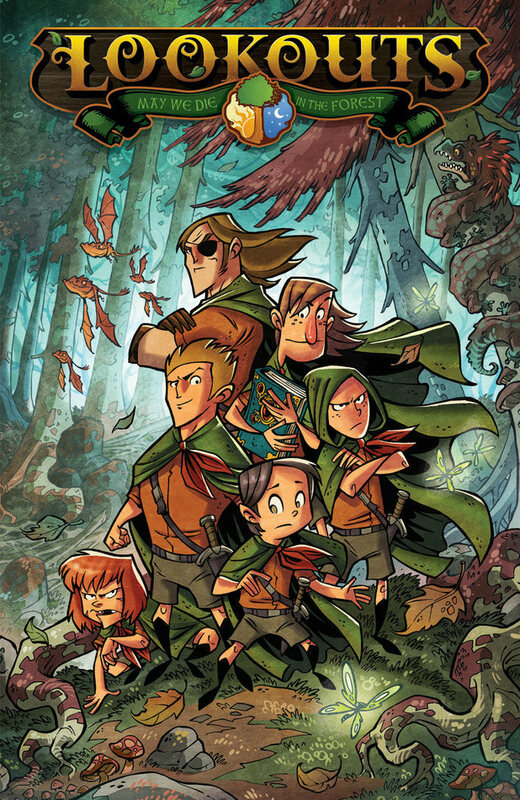 Now you have the new comic series called Lookouts from the minds of Jerry Holkins and Mike Krahulic, better known for the popular gaming website Penny Arcade. A couple of years ago, the created a few short pages of this series to judge their audience on how well, they would like this idea. It was very popular and they have developed it since then into this series and found a publisher in Cryptozoic Entertainment. The story begins with a family travelling late at night along a forest road. They meet with a sphinx who asks them a riddle. If they answer correctly, they may go on their way, if not, they may not continue and will be punished. As first the children are fascinated by the Sphinx but when it turns on them, thet are confused and frightened. Change the scene to a forest village market with a group of young children walking through it. They are led to meet with a village elder to be assigned a task in the forest. They are told of the sphinx that is rumoured to guard the road and are assigned to deal with it. But first their leader thinks they need a test to be sure they are ready to deal with something as cunning and dangerous. The story is engaging and unique. I really liked the idea when I first read about it on the Penny Arcade site but was disappointed that they only had a short story. Now that this book it out, it’s going to be one I pickup regulary for the kids. It’s well written and the illustrations are bright and detailed. I enjoyed the story and am looking forward to the next chapter. Is it right for kids? I would say it’s right for kids that in grade 1 and up. It’s not a scary story and there is no violence that is shown on panel. Older kids that are tired of the typical Super-hero stories should enjoy this. 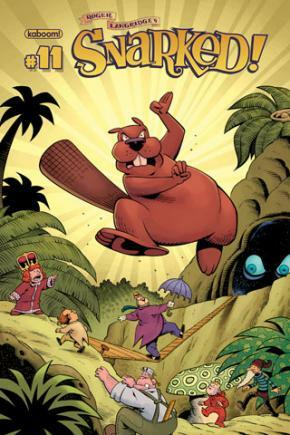 Snarked is a relatively new series in the comic world from a creator that has been around a while and has done really great work before.Roger Langridge has worked on other titles such as The Muppets and done great stories. He’s artwork is colorful and imaginative. Snarked is loosely based on Lewis Carroll’s Alice in Wonderland. To be specific, the characters of the Walrus and Carpenter. The are on a epic quest under the command of the Red Queen’s children, Princess Scarlett and her younger brother Rusty. They are in search of the Red King, who has gone missing. They have so far eluded the royal advisors and set sail on a voyage in search of the Red King. While on that journey, they meet several familiar characters from Wonderland including the Chesire Cat. The story is a bit difficult to get into right off the bat as it helps to have read the issue(s) before but it’s still an entertaining read and the art is nice to look at. Langridge has crafted a deep story with wonderful characters so it’s worth checking around for earlier issues either online or at your local comic store. Is it right for kids? It is but those kids should like reading and somewhat fantastic stories. This isn’t a comic book like your typical ‘done-in-one’ superhero story. There is an investment in time to be made but it’s worth the effort.